Visit Suzanne Collins' website for more information. Katniss and Peeta may have both survived the hunger games but that doesn't mean they are safe from danger. Katniss made some powerful enemies in the Capitol when she tricked them into letting both her and Peeta live and they aren't going to stop until they've taken her down. Especially since she has become something of a hero to the districts and has inadvertently caused some of them to start planning a rebellion. Katniss is facing her toughest challenge yet and she risks losing the people she cares about most if she doesn't do some very fast thinking. I still like I'm very much behind the rest of the world when it comes to this series, I read Hunger Games just before the movie came out and had fully intended to carry on reading the series straight away but other books captured my attention and over a year had passed without me picking up Catching Fire. Since the second film is out now I thought it really was time I read the book and I have to say I enjoyed it just as much as the first one. Again I was able to guess some of the major twists before they actually happened but that didn't stop me enjoying the journey. I still really love Katniss, she is so fiercely loyal to those she cares about and will always put her life and her happiness below protecting the people she loves. Sometimes I desperately want her to make the selfish choice and run but I wouldn't like her half as much if she actually did. She is in so much trouble in this book, President Snow is a powerful enemy who is determined to make her pay for her actions during the hunger games. He wants to take her down and he wants to do it publicly to quash the rebellion that is threatening to rise in the districts. It was great to learn a bit more about how Panem is run but I do still have a lot of questions about how the districts were created in the first place that I'm hoping will be answered in the final book of the trilogy. I don't want to say too much about the plot but I will say that we are introduced to some fabulous new characters along with getting the chance to catch up with old favourites. I still wish we'd spent more time with Gale but have high hopes he'll have a much larger role in the next book. I was firmly on his team in the first book, although I liked Peeta I just didn't feel he was the right guy for Katniss. Peeta needed her to look after him while Gale would be an equal partner. I have to admit that while I still want her to end up with Gale I did start to see more of a connection between Katniss and Peeta in this book, he shows several times how much she means to him and he definitely seems to have matured and come into his own a bit more. I'm kind of torn now but I don't think I'll be too upset whoever she ends up with. 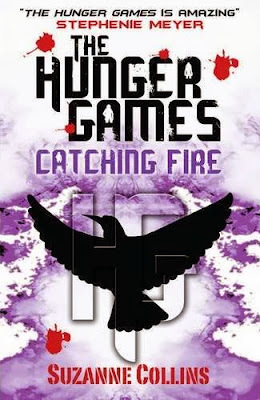 The last few chapters of Catching Fire were intense and they have left me desperate to know how the series concludes. There are things I know I'd like to see happen but I'm not sure if they will or not and I don't think I'll be able to wait long before I read Mockingjay to find out! I really enjoyed this review and I can agree with you on a number of things, especially in regard to the predictability of the plot. I easily anticipated the plot developments, especially the major ones, although that didn't stop me from loving every minute of the book! I also love that you love Katniss, because she really is an amazing character. Such a great role model for people of all ages. Her selflessness is incredibly inspiring and no words can do her amazing character justice.